This traditionally constructed three-over-three sofa features a clean modern element that is elegant and simplistic. Smooth crisp lines and sharp upholstered angles outline this sofa with a chic modern appearance, creating a contemproary sofa through high end modern art. Three plush seat and pillow back cushions adorn the front of this modern accent sofa, creating a soft place to sit with a smooth upholstered look. Compete with thin contemporary track arms and exposed wood legs, this living room couch includes all the elements needed to assist in making rooms look large, clean and sophisticated. This modern accent sofa is available in a fabric or leather option and can also be purchased in an assortment of sizes to accommodate the needs of large and compact living spaces. The 1065 Contemporary Sofa with Three Over Three Cushion Construction by McCreary Modern at AHFA in the area. Product availability may vary. Contact us for the most current availability on this product. 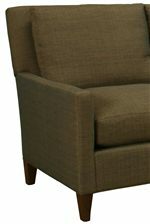 The 1065 collection is a great option if you are looking for Contemporary furniture in the area.